Anyone who has worked with tax lawyers knows that tax lawyers are different. They have a very exacting and demanding expectations for their tax resources. BloombergBNA recognized these high expectations when they undertook the development of a new tax platform. The tax product team spent two years and thousands of hours observing exactly how tax lawyers solve tax problems using BloombergBNA’s products as well as their competitors’ products. The result is a clean and intuitive dashboard offering both core tax resources and secondary materials as well as some totally unique new content and features. Bloomberg Law Tax is “portfolio centric.” BloombergBNA has taken their most prized editorial editorial content and placed them in the center of the new platform. The Tax Management Portfolios are the “granddaddy” of practice guidance tools. Each of the more than 500 portfolios offer deep and practical advice on each narrow portfolio topic. Portfolios now cover federal, state and international as well as trusts and estates. The portfolios are front and center in the platform design. A lawyer can easily search for a portfolio number or a IRS code section to begin their search. The editors of Bloomberg Law Tax wanted to build a “one-stop-shop” offering everything a tax practitioner could need in one place. Bloomberg Law Tax has all of the core “must have” primary content and extensive secondary analytical and practice material. Content is accessible using a variety of techniques including, keyword search, Boolean, and browsing topics. Although most attorneys start their research with a search, Bloomberg BNA has retained features which appeal to fans of portfolios in print. 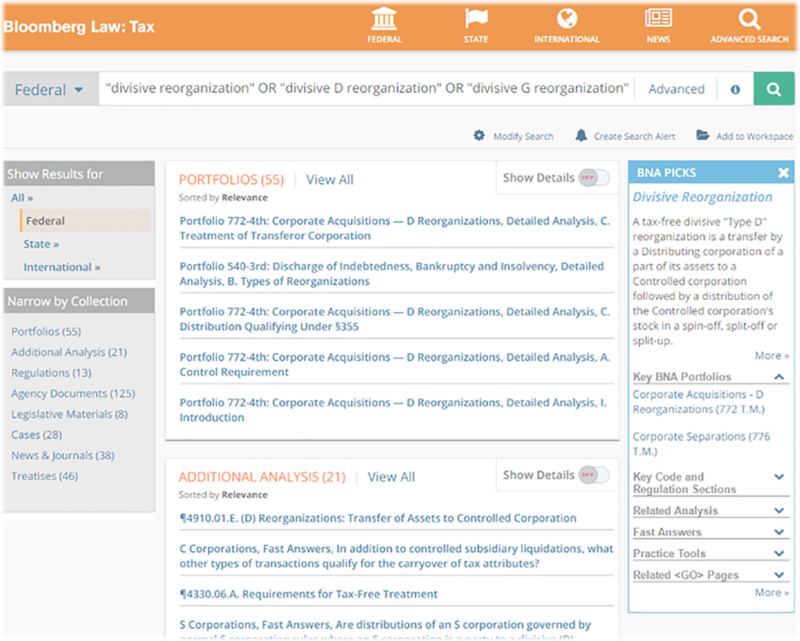 The portfolios can be navigated using an expandable table of contents, so that lawyers can have a “book-like” reading experience. Transactional diagrams illustrate more than 800 complex fact patterns and link to the related portfolio. A state tax “nexus tool” creates a custom questionnaire that a client can use to determine tax liability in various jurisdictions. Tax treaties includes original language version, and translation. Protocols highlight languages that has changed. Current codes update as changes occurs and include future effective date. Fast answers – provide answers to common questions with a link to primary source of answer. The citator includes regulatory materials. Custom Chart builders: State comparison charts can we sorted by topic or jurisdiction and provide answers and summary of relevant law. International chart builders provide comparison of tax rates across 114 countries. Hot News tool – crawls state agency websites for latest developments which can be filtered by topic and state. Workflow tools include research trails, electronic folders and notepads. The End of the Line for Print Portfolios? Can Bloomberg Law: Tax convert the diehard print portfolio fans to a digital platform. Those of us who hire filers to comb pages into the portfolios week after week, can only hope that a platform offering digital portfolios which are updated on a daily basis and which offers “one click” access to all underlying caselaw, codes, regs and collateral materials will be a sufficiently compelling alternative to even the staunchest bibliophiles. Access. Bloomberg Law Tax is available to all current Bloomberg Law subscribers at no additional cost. It is also available as a stand alone subscription.